Superman, empowered by the souls of Krypton, fights back against Eradicator while Lois protects Jon in the borrowed Bat armor. The fight gets more and more aggressive bringing sections of the Batcave down and rocking the surface of the moon. The quake draws the attention of NASA and their moon module and as soon as The Eradicator and Superman soar out of the crater the world media soon stream a live feed. Superman and the souls fight the android. One soul, trapped by Eradicator still resides within him and is fueling his fight while all the other souls aid the Man of Steel. Superman realizes who the soul is and with all his strength, physical and will based, he calls out to that soul, the most loyal of dogs... Krypto! With the combined might of both Krypto, Superman and the souls they create a massive ball of energy and soar downwards onto the moon surface. The force is on atomic levels and leaves Eradicator an almost lifeless husk. The souls converge above them, forming the House of El crest before dispersing into the afterlife. 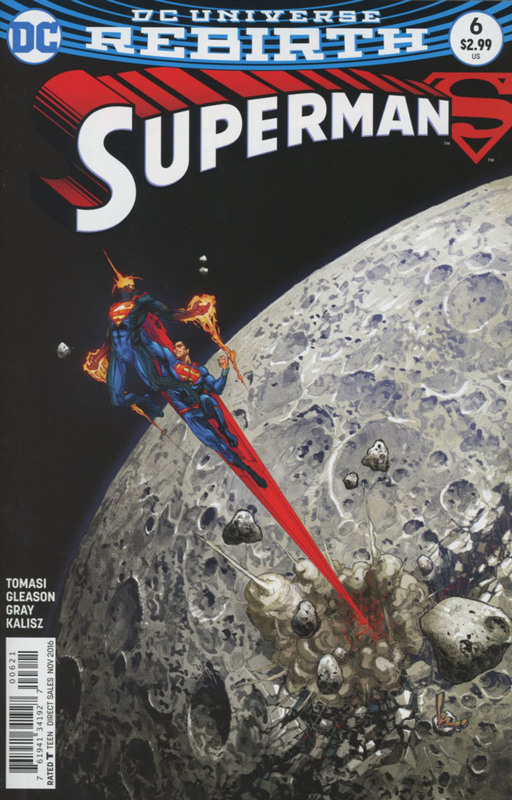 Krypto watches over the android's remains while Superman moves the moon module to safety and raises the american flag back to its pride of place on the moon's surface. The epic moment is captured on the live stream and Superman is revealed to the world once more. Superman and Krypto head home, but it isn't the end. Superman returns to Metropolis a hero, the guest of a huge parade and the recipient of the key to the city. Lois and Jon watch with pride on TV at home and Bibbo arrives at the parade to proclaim his friendship with Superman. But questions are raised and later that night Clark visits Jon with two gifts. A Hamilton County Huskers cap and a pair of spectacles to match Clark's. 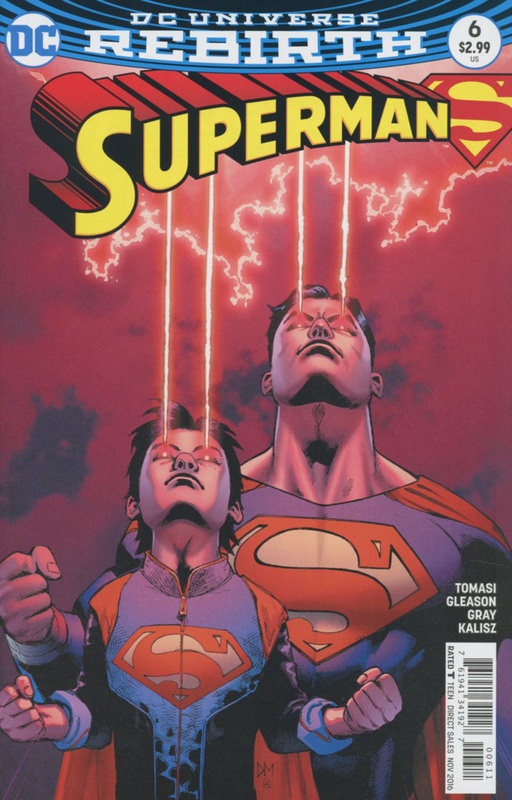 Jon is uneasy at having to keep more secrets and telling more lies, but Clark points out he isn't completely 'super' yet and more threats will rise in the future and to preserve their family, while fighting for truth and justice, this is a small price to pay. Clark has one more surprise, suiting up he and Jon travel to the Justice League Watchtower. There they find Batman angry at the destruction of his cave with Wonder Woman trying to calm him. Superman apologizes and tells Bruce 'we' will repair the damage. Diana is curious as to Clark's wording of 'we' but that is when Jon steps out of the shadows in his new role of SUPERBOY! Story - 5: Just like that... Superman is super once more. Not that he never was, but this is embracing a past and forging a new, unknown future. That, for a Superman fan, is cause for excitement. What can I say that everybody isn't already saying? This is a return to greatness for the character. There isn't much in the way of story this issue to be honest but it rounds out the story arc so well it deserves the 5. The farewell of the Kryptonian souls was touching and their goodbye even more so, I wonder what it means for Krypton's future as a whole. The little touches aren't unnoticed, like the raising of the flag, the scowl on Bruce, the bond with Krypto... it's all there and just made the book an absolute page turner. A happily married Lois and Clark along with Krypto and of course Jonathan and even the reintroduction of Bibbo have invigorated the character and mythos completely. In my opinion New 52 was a misstep and the old adage 'if it ain't broke don't fix it' was obviously the impetus behind this and Action Comics' new direction. I also was disappointed with the treatment of Krypto during the arc but, he's back and that makes me very happy! Superman is now out of hiding and though the road from Convergence and Road to Rebirth was a long one and at the expense of New 52 Superman, it's been an enjoyable journey and a great moment in time to be a Superman fan. I can't wait for next issue! Art - 5: The style is still difficult to gauge, hopping the borderline between cartoon and traditional techniques, but it is what worked for Batman during Gleason's run and it seems to be holding strong with Superman's new adventures. Some of the detail could be a bit heavier and the inking a bit lighter but that is personal taste more than anything. Cover Art - 5: Father and son together! Somehow they seem a much more natural team than Bruce and Damian, but regardless, we're looking at a cover and I just love it, the only thing I would have liked added is Krypto to the mix. Variant Cover Art - 5: Super cool as an action shot it really packs a punch. It has a very immersive cinematic feel to it. A brilliant end rounding the book to a 5/5.